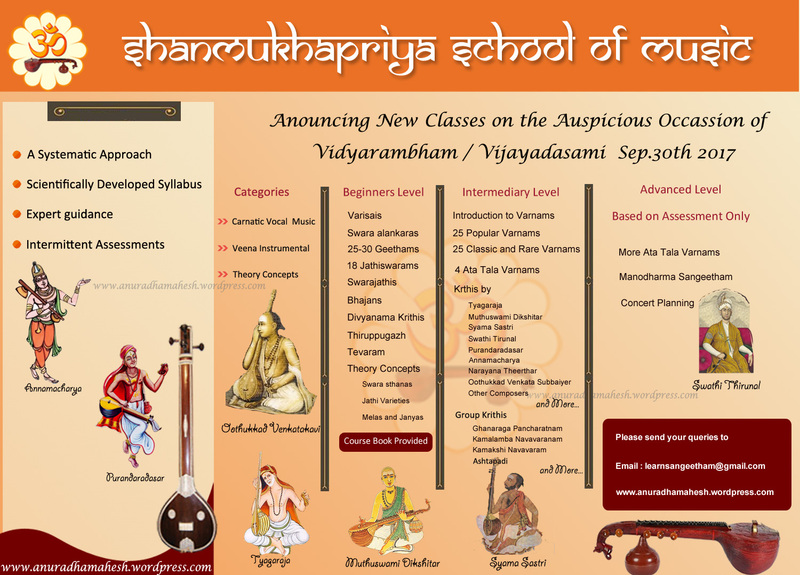 Announcing Classes for Carnatic Veena and Vocal on Vijayadashami Day 30th Sep.2017. If interested, please send a mail to learnsangeetham@gmail.com. My daughter is learning carnatic flute for the past 4 years and still she is in the 1st book (Ganamrutha Bodhini). I am not able judge her flute learning progress. Is there any exams to assess her flute knowledge? Kindly suggest, how to take her flute learning forward.I am in Chennai. Let me be very frank in telling that music is not in the number of books a person learns. When I was a kid it took 3 years and 6 months to start varnam level. We had a very grounded training on varisais, akaara sadhakam, singing varisais in various ragas, sight singing of swaras, singing various jaathis of Talam etc. I remember having learned more than 35 geethams. Now a days, everything is in capsule form and a few varisais, 4 geethams are enough to graduate to a varnam level. How many hours your daughter practices everyday ? If she is Practicing for nearly 3-4 hours everyday reducing the number of mistakes each time, may be her teacher will take her to the next level. If she really wants to progress, there is no shortcut method. Practice alone helps. Consistent practice everyday for a minimum of 4 hours is absolutely necessary, if she is choosing this as her career. If she is learning flute as one amongst many other art forms like dance, drawing etc, it may take years to make remarkable progress. Thank you very much madam, for your clear explanation. It has cleared my doubts. Thanks once again. There is a mention of Nagabandha Varisai in that. I would like to buy that book as I want to practice Nagabandha Swaras. I humbly request you madam, please, to guide me, where I can buy that book. If it is not a book, but, the contents of the course that you teach, may I request you please to accept me as student and teach Nagabandha Swarams? This advanced varisai is available in the book that I have published Sangeetha Sampoorna level 1. You can purchase the book. This varisai can be practiced in all melakartha ragas. I have notated the series of varisais that begins with the Swara Sa. The student can try notating the varisais beginning with the remaining swaras R G M P D N following the pattern used in the Sa Series. I have purchased your Sangeetha Sampoorna level 1 book for my daughter. We are living close to delhi. I myself teach her. Please suggest how she can give exams and get certified in each level. If you want your daughter to be certified for each course, then I think you may have to enroll her with some university, so that she can take exams. I want to learn veena. I am beginner actually. I looking for a personal class.I am residing at madipakkam chennai.